Welcome to this instalment of what I have somewhat ambitiously called Another Grand Adventure, part of my occasional Travel Spot series. It follows my second long-distance American train trip, which saw me travelling from Boston, in New England, to Phoenix, in the south west, by train. Well, almost. I actually went from Providence to Tucson by train, driving the first and last legs. If I’d had the courage of my convictions, I’d have carried on from Tucson to Los Angeles so that I could have completed my second coast-to-coast train journey. However, given that I actually had to be in Phoenix for work, this would have required me to turn around and come straight back again once I got to LA. That would have been rather extreme, even for me. The trip started with my flight to Boston, while the second instalment covers the series of short journeys I took along Amtrak’s Northeast Corridor from Providence to Manassas, south of Washington DC. 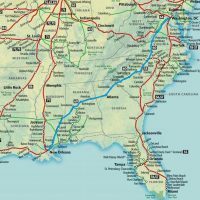 This instalment takes us from Manassas to New Orleans, travelling on Amtrak’s Crescent Service, while the remaining two instalments will cover the leg from New Orleans to Tucson on the Sunset Limited and my flight back from Phoenix. You can read more about the Crescent service after the gallery. It pleased me no end that the train I caught from Manassas to New Orleans, Amtrak’s Crescent service, was the same train that I’d caught from Philadelphia to Manassas, albeit exactly 72 hours later. I’d spent the intervening three days staying with my friends in Centerville, mostly catching up on my sleep and working. As an aside, Centerville was once a major railway hub in its own right, but now, ironically, lacks any passenger services. So there I was, 72 hours later (pretty much to the minute, since both trains had very similar delays) catching the Crescent, this time to New Orleans, a journey of 25 hours. Whereas on the way to Manassas I’d sat up front in coach class, this time I was travelling at the back in a sleeper car, which, as it turned out, called for some interesting fun and games when boarding the train. Most of the stations, like Manassas, see a handful of trains a day, although there are plenty which see just one or two in each direction. Even my destination, New Orleans, in many senses a major terminus, only has a total of five trains a day (two arrivals, two departures and, depending on which day it is, one additional arrival or departure). As a result, most stations are really small. Really, really small. Sometimes I think the station consists of no more than a waiting room and a sign by the side of the tracks. Manassas is, in the grand scheme of things, quite a big station. Since it’s on the Virginia Railway Express commuter line into Washington DC there’s a proper waiting room and two platforms, one in each direction. These can accommodate four, maybe five railway carriages. And herein lies the problem. The Crescent service is, compared to some, a fairly short train, but it’s still much longer than the platform. First there are the two enormous diesel locomotives (replacing the single electric locomotive that hauled the train from New York to Washington DC), then there are three coach class carriages, the café car, the dining car, two sleepers, a business class carriage and finally, right at the back, a crew/baggage car. As my American friends say: do the math. There is no way that train is going to fit onto the platform at Manassas. Now, if this was a British train, it wouldn’t really matter. It would just pull up, everyone would get on at the front, and those that needed to be at the back would wander on down. However, things aren’t that simple on Amtrak. First the train pulls up, a solitary door in the third (and final) coach class carriage opens and the disembarking passengers get off. One by one. Next, those of us waiting on the platform get on. One by one. The guard checks everyone’s ticket to ensure that they are on the correct train, and, more importantly, the correct part of the train because if, like me, you have a reservation for a sleeper car, you don’t get on here. Oh no. You wait until everyone has got on, then the door shuts and the train pulls forward a couple of carriages and another solitary door opens in the sleeper car and the sleeper passengers (just me, in this case) get on. I did feel for the solitary guy who was travelling in business class since even with the train moving up, the business class carriage was still off in the distance by the level crossing at the end of the platform. And heaven forbid he got on one of the sleeper cars and walked through, so he had to trek off down to the end of the platform to get on. With that palaver safely out of the way, we were ready to move off, maybe ten minutes after the train first pulled in. Now although this strikes me as dreadfully inefficient (the train has about 20 such stops, so you could probably shave a couple of hours off of the journey time if you tried), in some ways makes sense, particularly given the way Amtrak works. The whole railway strikes me as very manually intensive. Each coach seems to have its own guard, who checks your ticket and (with the exception of the Northeast Corridor trains) assigns you an individual seat. The result is a lot of queuing and waiting when getting on and it’s also why as a sleeper car passenger, I couldn’t board a coach class carriage: the guard there wouldn’t have known who I was. The irony is, when I did get on the sleeper car, I didn’t show my ticket, the Amtrak app having logged me out (pro-tip, even if, like me, you use the Amtrak app, which is very handy, always have a printed copy of your ticket, or, failing that, a screen shot of it). The plus side of the system is that the guard knew who I was anyway since I was the only sleeper passenger boarding at Manassas, so I was shown to my cabin regardless. The big positive of this whole system, and the reason why, I suspect, that Amtrak does it this way, is when it comes to getting off. With all the small stations, you can easily find yourself in the wrong part of the train, or, frankly, just miss your stop altogether (Oh, what? That five minute stop in the middle of nowhere was my station? Damn, I’ve missed it!). I’ve seen this happen in the UK, by the way, where people have sat at the back of a long train which has pulled up at a short platform and they’ve just not had time to make their way up the train to get off. On the Amtrak services, because there’s a guard for each carriage who (usually) knows where you are going and has put you in a specific seat, the guard will come and tell you, in person, that your station is coming up in 10 minutes’ time. It also explains the obsession with ensuring that you are in the correct carriage / seat. Going to Clemson, South Carolina. Then you’ll be in the second carriage, because that’s the only door that will open when we get to Clemson. And so on. I might tear my hair out at the inefficiencies of the system, but there’s no arguing that it works. You can read all about my experiences in my sleeper cabin after the gallery. My first-ever Amtrak sleeper experience was also going to New Orleans, back in 2010, although that was on the City of New Orleans which covers the 900 miles north to south from Chicago to New Orleans via Memphis once a day. Since then I’ve also been coast-to-coast from Portland (Maine) to Portland (Oregon), which involved taking the sleeper from Rochester to Chicago and another from Chicago to Portland. East of a line from Chicago to New Orleans (although, interestingly, not on the City of New Orleans service between the two), Amtrak runs its Viewliner rolling stock. Each Viewliner sleeper carriage has a one large and two smaller bedrooms, with a corridor down the side of the carriage, followed by a long corridor with standard sleeper cabins on either side. In comparison to the rest of Amtrak’s rolling stock, where the central aisles between the seats are wide enough for two people, these corridors are incredibly narrow. Aside from the three bedrooms, there are 12 standard cabins (known by Amtrak as roomettes), six on either side. At the opposite end from the suites, what would have been sleeper cabins #13 and #14 have been replaced by a shower on one side and crew quarters on the other. Each of the sleeper cabins have two berths, although if you book a single ticket, you’ll get a cabin to yourself. If you’re used to travelling by train in the UK, the first thing that strikes you about US trains is how tall they are. Although the Viewliner sleeper cars are single-deck, they are very tall, resulting in a spacious cabin which is long and thin. There are two seats, one facing forwards, the other backwards, with a fold-out table between them. This means that you get to sit in comfort in your own private cabin during the day and both of you get access to the window, although the seats are close enough together that two tall people might have problems banging knees! This is in stark contrast to the sleepers I took in 2016, where in both Vietnam and China, you had four people to a cabin and only one window/table. It’s also a very different experience from the sleepers I took in Thailand, with their open-carriage arrangement. One of the seats is slightly narrower than the other, although both are wide by UK standards (and positively palatial compared to airline seats). The narrower seat makes room for a small toilet, which also has a fold-down sink above it, so if you really want to, you can spend the entire journey in the confines of your private cabin without ever venturing out. The wider seat doesn’t quite stretch the full width of the cabin, ending just short on the corridor side, leaving enough space for a wide shelf, handing for keeping bits and pieces or a small bag (my coffee kit lived there). Alternatively, when the toilet seat is down, I found that made an excellent storage space as well. Of the two, I preferred the smaller seat, partly because, on the train I was on, it was facing forwards, which I prefer, although I have no problems travelling facing backwards. The narrower seat was also handy because the power outlets are next to it by the sink/over the toilet, so I didn’t have any wires trailing across the cabin. My only other problem with the wider seat is that the heater/air conditioning ducts are at that end, and I found the airflow annoying, to the extent that if I had to sit there for any length of time, I would have turned them off. When it comes to sleeping, the two seats are pushed together to form the bottom bunk, while the top bunk is lowered down from the ceiling on some sort of rack and pinion system. Both are long enough that, at 6’2”, I could fully stretch out in them. One of the nice things is that, given the height of the cabin, the top bunk, when it’s full raised, is a long way above you, so I could easily stand up without hitting my head! It also means that, if you’re travelling alone, you can use the upper bunk for additional luggage storage, although there’s also a very large luggage space on the other side, above the door, which easily swallowed up my massive rucksack. Of all the sleeper cabins I’ve travelled in, it’s got the most, and the most convenient, luggage storage space. If you’re interested, Amtrak has a handy virtual tour of the Viewliner on its website. You can find out how I got on actually sleeping on the train after the gallery. We left Manassas just after 19:30 on Thursday evening, with a scheduled arrival time in New Orleans of 19:32 the following day. Bearing in mind that New Orleans is on Central Time, one hour behind Manassas, which made for 25 hours on the train. One of the nice things about travelling on a sleeper ticket is that your meals are included, so in theory I was entitled to a free dinner that evening. However, prior experience with Amtrak had taught me that they tend to eat early. On the train down from Philadelphia three days earlier, the first call for dinner had been 16:30, so rather than rush settling into my cabin, then heading down to the dining car for a late sitting, I ate with my friends before I caught the train. Instead, I took my time getting settled in, getting used to the rhythms of the train. Having figured out how to make best use of the table, I got on with some work, taking advantage of the free Wi-Fi. When I’d taken the same train two years ago, the Wi-Fi hadn’t worked, so this made for a pleasant change and I get the impression that Amtrak’s worked hard to improve both the Wi-Fi coverage and the speed/reliability of the service. I certainly had no problems surfing the web, uploading Coffee Spot posts and watching (short) YouTube videos. Since this is a sleeper car, it goes into quiet mode at 22:00, with no more announcements, at which point you are (quite reasonably) expected to keep the noise down. If you don’t fancy spending all your time in your cabin, the alternative is to head up to the lounge/café car, where there are four-seater tables which anyone is free to use, although it does close at 23:00. The sleeper car attendants will make your bed up for you on request, so you don’t have to worry about figuring out which levers to pull, etc. In the end I got to bed slightly later than I’d intended, staying up late to finish a Coffee Spot post, so it wasn’t until gone midnight that I finally got my head down. With the door closed (and locked, although you can’t lock it from the outside) and the curtains drawn, it’s really quite cosy in the sleeper cabins. There’s lots of lighting options, including a main cabin light, a night-light, lights above both seats an individual reading light for the top bunk. You also have pretty good control over the temperature and the airflow. A word of warning about the curtains though. While they are pretty effective, they fasten with Velcro, which, over time, can get rather gummed up and hence doesn’t work that well, so you need to be both patient in securing the curtains and check you’ve fastened them in multiple places if you don’t want them to come unexpectedly undone in the middle of the night! You can see what happen next after the gallery. I decided that it was far too early to actually get up, so lingered in bed for a while. There was a 07:30 breakfast call, after which I decided to get up, wait for the 08:00 call and make my way down to breakfast. So I waited, then I waited some more, but there were no more announcements. At 08:15 I decided to see what was going on. On my three previous journeys I’ve been blessed with some very competent sleeper car attendants. Sadly, this was not the case on this trip. I think the guy was new, but whatever the reason, he didn’t seem to know what was going on. He told me that the dining car would be closed until we left Atlanta, so I headed back to my cabin to wait. Having left Manassas running slightly late, the train had become even more delayed. The previous night, we’re scheduled to reach Lynchburg at 22:00, but had arrived there at 22:30 and we were scheduled into Atlanta, Georgia (having travelled right across North and South Carolina through the night) at 08:13, around about when I first went in search of breakfast. As it was, we didn’t reach Atlanta until 08:38, which was when we were scheduled to leave, although, looking on the bright side, at least we hadn’t been further delayed. We were scheduled for a 25-minute layover, so didn’t leave until just gone nine o’clock, at which point I decided to wait for an announcement that the dining car had re-opened. When that didn’t come, I wandered down, arriving at 09:15, only to be told that the last breakfast sitting was supposed to be at 09:00. However, the staff took pity on me, seated me all the same, and I had a very nice breakfast of cheese quesadillas while chatting with a young man who works for the New York subway. Having seen nothing of the countryside between Manassas and the Georgia state line, on account of being dark, I starting paying attention to my surroundings. Pretty much the only thing I know about Georgia, geography-wise is from watching the TV series, The Walking Dead, which is set in the countryside around Atlanta. The real Georgia countryside felt somewhat similar, although there were a lot more trees. In fact, we seemed to spend most of our time going through forests, which was nice, but which did somewhat limit the views. The dense forest was interspersed with the occasional small town which, at one point, must have been served by the railroad before the ubiquity of the car. The line itself was mostly single track, with the occasional long sections of double track which acted as passing places. There wasn’t as much freight as I was expecting, but what freight trains I did see were parked up on the double sections, which I’m told, is standard practice. Even though the lines are owned by the freight companies, Amtrak’s contract gives their trains, which are faster, priority. However, our luck didn’t hold and at about 10:30 we moved over onto one of double-track sections and came to a halt. We were there for half an hour while two enormous freight trains passed the other way. Then, instead of carrying on, we backed out of passing loop, which is a first for me, transferring over to the running line before carrying on our way. All soon became clear: another freight train was parked up ahead of us in the loop, necessitating our bizarre manoeuvre. By backing out, we at least managed to overtake than one and avoid any further delay. It also explained why we’d been held to let the other freight trains pass: while the passing loops are several miles long, so are the freight trains, so they can only hold one at a time! At least being stopped gave me a chance to indulge in one of my favourite activities on long distance trains: making coffee. You can see how that went after the gallery. When it comes to making coffee, one of the first things I learnt about trains (and any other moving vehicle for that matter) is that scales are pretty much useless. The vibration of the train (plane, etc) makes weighing anything impossible, which is why, particularly on long-haul flights, I pre-weigh all my beans and use my Travel Press, which has a handy 300ml mark etched on the inside, so I don’t need to weigh my water either (yes, I am normally that obsessive). However, one of the few advantages of the long layovers, either at stations, or, as was the case here, in a passing loop waiting for a freight train, is that your scales come into play again. So, I got out my coffee kit, weighed out my beans and decided to make the most of the situation to make an Aeropress using a lovely Ethiopian Sidamo single-origin, a gift from Sarah’s Caring Coffee. Instead, I dutifully trudged off to the café car with my Travel Press (which, when I’m not making coffee with it, makes an excellent vessel for carrying hot water, far better, on a moving train/plane, than an open jug!) to get some hot water. This is where I ran into one of Amtrak’s stupidest policies, one designed explicitly to increase, rather than decrease, wastage. Under this enlightened regime, the café car staff are forbidden to provide hot water in anything other than a disposable, one-use coffee cup. Forget the fact that I’ve brought my own container with me. Forget the fact that the first thing I do is pour the water from said disposable, one-use coffee cup, into my Travel Press, a far safer method of carrying it back to my seat than a flimsy, paper cup. Forget the fact that since the said disposable, one-use coffee cup has now been used, albeit to house hot water for about 20 seconds, it must be disposed of. I can’t even keep it and use it next time I want hot water since it has to be a new cup each time. Forget all that and just add to the mountain of waste we generate every day. I know in the grand scheme of things, it’s not a big deal, but it’s so avoidable and such a very stupid policy. Slightly seething, I took my Travel Press full of hot water back to my seat, ground my beans with my Aergrind travel grinder, and made a very fine Aeropress with it, so at least this particular tale has a happy ending. You can see how I got on during the rest of the journey after the gallery. Following the hold-up in the passing loop, we were running about an hour late, crossing the state line from Georgia to Alabama at 11:00 EST/10:00 CT, the time change being one of the curiosities of long-distance east-west trains in America. It can also throw out meal times, since they are always served at local time. Thus there was only one sitting for lunch, at 12 o’clock Central Time, which seemed fairly soon given that I’d only finished breakfast at 09:30. Except that was 09:30 Eastern Time. Add on an hour and suddenly lunch seemed that much further away! I went for a wander after my coffee, exploring the train. One regret is that the baggage car at the back of the train denied me one of my great pleasures: standing by the window in the door of the final carriage, watching the track disappear behind us. At lunch, I had a very fine salad, followed by pecan pie for dessert, after which I went back to my compartment and had a ¾ hour post-lunch nap. By now, we had left the cold and snow of the northeast far behind and it was a beautiful, sunny day outside the windows of the train, getting warmer by the hour as we went further south/west. Our next major stop was Birmingham, Alabama. I’ve never been to either Birmingham or Alabama (nor, for that matter, have I been to Atlanta or Georgia) and I don’t really count this as going there either. While passing through on the train has given me a much better feel for both states, I don’t think I can cross either of them off the list until I’ve gotten off the train and out of the station. One day I’ll redo this journey and break the trip with a day or two in each city if I have the time. The line spent a while following a large river (the Coosa?) on the way into Birmingham and while the countryside was still very heavily wooded, it was getting markedly hillier, with large hills in the distance. By now we were running 1½ hours late, reaching Birmingham at 13:25 rather than our scheduled time of 11:50. While we managed to shave three minutes off our delay, having a 15-minute layover rather than the scheduled 18 minutes, our approach to the station rather neatly illustrated the absurdity of much of Amtrak’s long-distance passenger service. One of the disadvantages of the sleeping car compartment is that you only really get to see out of one side of the train, in my case, the left-hand side. I was aware that we’d reached Birmingham itself because our surroundings had become distinctly urban as we rolled through the city centre and pulled up at a siding, where we laid up for several minutes. What I’d missed during all this is that we’d already gone past Birmingham Station, which was on the right-hand side. We were waiting here to let a freight train go past, then, in the most absurd manoeuvre of the whole journey, we reversed across several running lines and backed into the platform. That manoeuvre alone must have put at least ten minutes onto the journey time. The issue is that Amtrak doesn’t own the tracks: the freight companies do. And freight trains have no interest in stations, so the station is off to one side of the main running tracks. And since there’s a certain expense involved in putting in the points and signals that allow the trains to cross over from the running lines to the platforms, the freight company had only done this for the northbound tracks, hence our interesting pass-park-reverse manoeuvre. With that out of the way, we were off again. Just south of Tuscaloosa, we passed our opposite number, the Crescent service from New Orleans to New York City, which was waiting for us in a passing loop just after 15:00. We made up a little of our lost time, reaching Meridian, just across the state line in Mississippi, at 17:15 (scheduled for 14:58). This was the cue for dinner, which was served once we left Meridian. I once again shared my table with the gentleman from New York, chatting about trains as I tucked into a very lovely sweet potato gnocchi, with cheesecake for dessert. After that, it was back to my compartment for the remainder of the journey, which, in theory was only meant to last a couple of hours. However, we were still running around 1½ hours late, so we trundled across Mississippi, the landscape slowly morphing from forest into swamp. Instead, I packed away my laptop, hoisted my pack on my back, said goodbye to the train and headed off for my hotel. You can find out how I got on, and what happened on the final leg of my journey, from New Orleans to Tucson, Arizona, in the next instalment of Another Grand Adventure. This entry was posted in Brian's Travel Spot, New Orleans by Brian Williams. Bookmark the permalink.